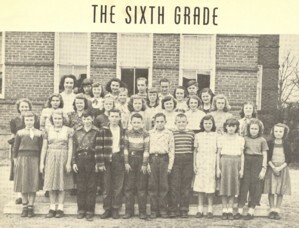 Jack Hogan, a 1954 graduate of Bogart High School, writes about his memories and experiences in a small town grammar school in Bogart in the 1940s and 1950s. I experienced many of the same things at Watkinsville grammar school during the same period. In this article written on March 7, 2006, Jack tells of many games that children of our generation (and that of others) found to entertain themselves. It took imagination, agility and energy of youth and little money to really enjoy recess and life. One wonders if the more affluent toys and playgrounds of today can provide the same experiences. AVOC thanks Jack Hogan for his efforts in preserving this important part of our history and heritage. 12-24-05 Memory Lane - Lewis Grizzard, UGA, GA 316 and more…. 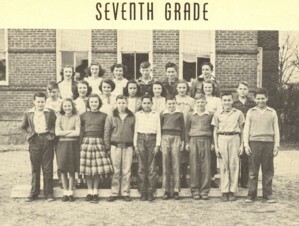 "Grammar" school students attending the Bogart School, Bogart, Georgia, back in the 1940's and '50's didn’t have much play ground equipment with the exception of swings, a slide, and a merry-go-round. Oh yea, we did have a saw horse, which wasn't much fun. At the Bogart School, we learned early how to improvise our entertainment during recess and lunch periods. Additionally, outdoor equipment sometimes included a bat and softball, and a tired old basketball. That was about it. We had two 20 minute recess periods, one midmorning and one mid-afternoon. We also had a rather long lunch period. Unless the weather was especially bad, we spent most of the time outside. The swings got a good workout every day, especially by the girls. The older boys generally teamed up to play running games. The girls would play jump-rope or hopscotch or something like that. Sometimes the boys and girls would play together the game "Send Rover Right Over," which was a simple game where everyone formed a circle holding hands. Someone would then be designated to be the caller, and would say send John or whoever right over. He or she would run and try to break the hands grip between two players. If one broke the line, then the breaker became a part of the circle and the ones that he broke through would go in the middle of the circle. The girls would sometimes play "Ring Around the Roses." The boys played a lot of "1-2-3 Willie Wee," which was simply a running game. We choice up sides and ran after the opponents. We had to say "1-2-3 Willie Wee" while holding on to some part of their body or clothes. We would take them to jail where they stayed until someone on their team tagged them out. Runners, guards, etc., were appointed at the beginning of the game. It was a creative game because a lot of times we made up the rules as play continued. On, then there were "Marbles" and Spin the Top," games of skill. Almost every boy had a few marbles in his pocket. The marbles were of different size, color, and composition. The favorite was a big glass shooter or steel marble. These were simply steel ball bearings salvaged from some piece of farm equipment. The bigger the better because the steel marbles were heavy and made good shooters. There were also just plain glass marbles. A circle about 2 feet in diameter was drawn on any smooth patch of bare ground, usually between the old high school and two room wooden first and second grade building. Every player contributed his share, or about 5 marbles, and these were dropped into the circle. A "taw line" was drawn about 10 feet away. Each player pitched his shooter marble towards the taw line. The closest to the line got to shoot first. He got to keep all the marbles he could knock outside the circle and could continue to shoot as long as he could knock marbles out of the circle. The accuracy of the shooter often depended on his method of holding the marble. The shooter had to keep "knuckles down" unless he was inside the circle. This game required a lot of crawling on your hands and knees. When the teacher wasn't looking, we generally kept the marbles we knocked out of the circle. Talk about gambling! In the sixth grade, Miss Ruby Phillips broke up a fight between Tom Jones and me. We got into a wrestling and boxing match because Tom has pocketed some of my marbles. Somehow Tom's noise was bleeding when Miss Phillips broke up the fight. When I got home, I told Mom about it and she replied, "Who won?" She never told Dad, and I didn't either. Tom and I were good friends after that and often traded comic books. He lived around the corner near Cash's Cotton Gin. Tom and his family moved away from Bogart after our seventh grade. "Spin the Top" was also a popular game in grammar school. We would draw a circle in the dirt, put soda-pop caps in the circle, and spin our top at them. We kept any caps that our top spun out of the circle. Occasionally, if the teacher wasn't looking, or was inside, we would pitch pennies at a crack or line. The one whose penny fell nearest the line could keep all the pennies on the ground. Generally only a hand full of boys played because a penny was a lot of money in those days. Also, it wasn't a very popular game for me because if the teacher caught you, she confiscated all your pennies until the end of the week. Something about gambling was usually mentioned. Then there was "roll at the bat," a soft ball game that we sometimes played during lunch period. The pitcher would lob the ball to the batter who hit it. Everyone else would go to the infield or outfield, just about anywhere on the field. If you caught the ball on a fly then you could go in and bat. If you caught it on bounce, you could roll the ball at the bat. If the ball hit the bat, then you could go in to bat. Of course, there were a zillion boys and girls in the field to catch the ball or roll the ball at the bat. There were times when the boys would choose up sides and play sandlot tackle football before school started or during recess. Oh how I remember those games in the seventh grade. On one occasion, I was tackled rather hard and received a hard blow below. In a couple of days, Dad took me to the doctor because I was having terrible pains and difficulty walking. Doctor Elder ordered to bed for two weeks without touching the floor until the healing process cured all. I remember Mrs. Joyce Standefer coming by the house to take me to school on the morning of our seventh grade Christmas party. Names had been drawn and I had a present for one classmate whose name Mrs. Standefer had given me. Billy Wilson gave me a big-little book about the Long Ranger. But, when he realized that I didn't draw his name and didn't get him a present, like a good little Indian-giver, he insisted that I return the book, which I did. Whatever happened to Billy? If the weather was bad we stayed indoors and drove the poor teacher up the wall. There were always some chores to be done, blackboards to be cleaned, and sometimes sides were chosen for two or three teams and we would have a spell down. It's possible that we didn't learn as much in school in those days as students do today. But we did learn one thing, and that was how to entertain ourselves. I can't remember a single time that I was ever bored in school. As a matter of fact, I just barely knew what the word meant until I heard a child say the other day "I'm bored." With radio, T. V. programs, videos, computer games and modern teaching techniques, schools seem to have lost the art of self entertainment and a lot of other meaningful experiences in life.